← Marine Recalls UFO at Gitmo. Radar Confirms. 2 Odd Shaped Lights Hover in Sky. 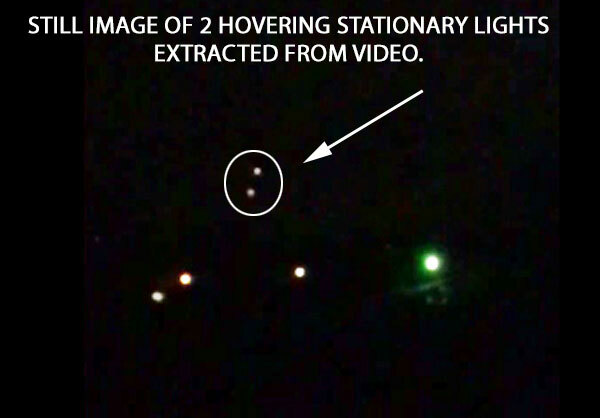 STILL IMAGE OF 2 STATIONARY LIGHTS EXTRACTED FROM VIDEO. Description: A man took a video (see clip above) of two lights that he said were odd shaped. He shot the the video at 9:44 PM on Nov 12, 2018 in Arlington, WA. Skies were clear at the time. The video was taken with an I-phone at full zoom. The lights did not seem to be a plane or helicopter. The lights were sitting there hovering. The lights were not consistent with a helicopter. One light moved away so that only one was visible. The lights on the lower horizon were a neighbor’s lights. The neighbor was at a distance of five acres. The light hovering was much farther away. Note: I agree with the witness that the lights are not from a plane or helicopter as they are not blinking. This entry was posted in Formation of Lights, Orb(s) of Light, Photos, Strange Shaped, UFO Sightings 2018, UFO Sightings Washington, Video Clips and tagged Hovering. Bookmark the permalink. One Response to 2 Odd Shaped Lights Hover in Sky. The objects are certainly flickering, which could mean those are normal aviation lights at a distance. The “hovering” is likely nothing more than the objects/aircraft coming directly toward the observer or possibly very slightly off at an angle.